Of all of the various genres of sewing projects, pajamas hold a special place in my heart. All my kids and I enjoy designing a new set together and when we're not busy doing soccer or baseball, we really do enjoy hanging around the house a lot in our pajamas. What can I say? We like to be cozy! When I saw this percale sheeting, I knew it'd be perfect to for a new set of Closet Case's Carolyn Pajamas for me. 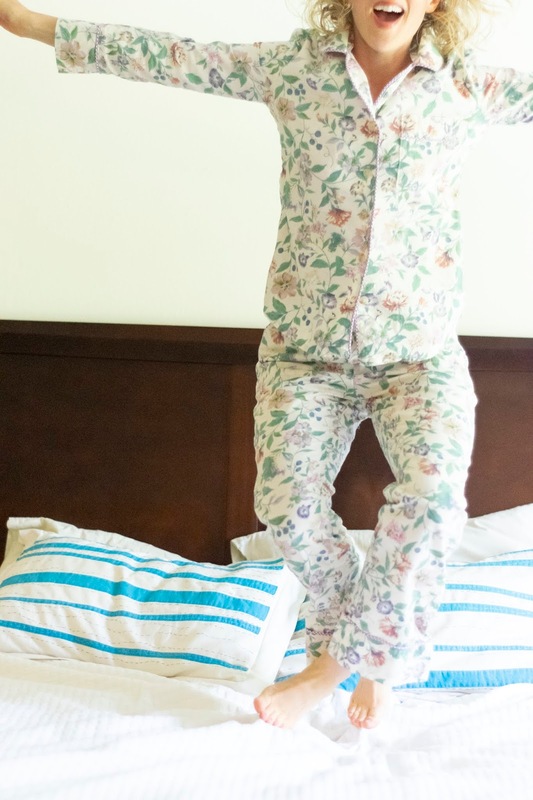 What could make a more comfy set of pajamas than a fabric meant for sheets? And this percale in particular washed up so soft. I've washed the fabric 3 times now, and it seems to be getting even softer which is positively lovely. This particular sage/coral floral print is nearly out in the shop, but there's many other percale prints to choose from. I know the Carolyn has been a really popular pajamas pattern since it came out, and now I get it. There's so many good details in this pattern! It's really thoughtfully drafted, the directions are clear and easy for sewists of all levels, and there's piping. Any time I get to pull out my piping foot, I'm there. I love the extra little bit of class it adds, and it's a perfect place for adding a little contrast fabric. For my piping, I cut bias from a mens' purple gingham shirt. Florals and gingham are such a classic combination, and I love how gingham looks on the bias. Plus the shirting is a perfect weight for making your own piping. It's not marked on the pattern, but it took nearly 5 yards of piping to trim my set of size 0 top and size 6 bottoms. One tip I can give you is to pull the cording out at the end of an edge and trimming off about 1/2". This way, you'll keep any extra bulk from the cording out of the seam. I've made pajamas for my boys with and without back facings before, and hands down, I prefer having the facing. It's so nice to have that extra piece that finishes off the shoulder seams so cleanly on the inside. Because this pattern doesn't include one, I quickly drafted my own. Instead of finished the facing unit with the serger, I trimmed it with more bias. Overall, this set was such a joy to sew, and I have been lounging around like a queen and jumping on the bed like a kid! If you're looking for a really awesome cotton that's beyond comfortable, definitely go check out the percales! What's your favorite pair of pajamas you've made? Gorgeous pajamas! I really love the gingham and the floral together. What width of cording do you use to make your own piping? Thanks Ann. It was 3/32" cotton cording. I've used thicker, but this was a nice width. Rattail is similar width, but the cotton is much easier to work with in my opinion. Beautiful PJs -- great workmanship! Perfect pairing of fabric and pattern! Lovely pajama set, and the piping and the back facing make it really refined! Thank you! I definitely prefer the cleaner finish a back facing provides!